Auto transportation companies typically ship cars in large steel shipping containers or on board Roll on Roll off (Ro/Ro) vessels. 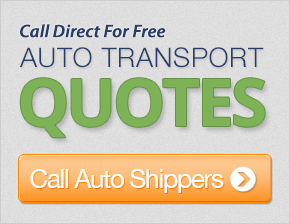 Both options are widely used by customers to ship cars between the U.S. and destinations around the world. Deciding which option is better really depends on personal preferences and factors like budget, type of car, and the amount of time available to transport the vehicle. Container shipping is by far the most popular option for transporting goods by sea these days. With this option, cars are transported to their destination in 20-foot or 40-foot long steel containers. A 20-foot container can hold the contents of an average three-bedroom home, while a 40-foot container can store the contents of a five or six-bedroom home. In some cases, shipping companies might also offer what are known as high-cube containers to transport cars, but the most commonly used sizes are the 20-foot and 40-foot containers. With overseas container shipping, the auto transportation company will, typically, pick the vehicle up from the customer’s location and transport it by road to the port from where it is to be shipped. The car will then be loaded into a container along with any other personal goods or household items that the customer might want to transport. Sometimes, a shipping company might simply leave a container at the customer’s location and pick it up after it has been fully loaded. Customers have the option of loading the container themselves or hiring labor to do it for them. Most shipping companies offer what is known as a Less than Container Load (LCL), or a groupage option, for customers who only have a limited amount of items to ship and may not require a full container. With the LCL container car shipping option, shipping companies consolidate items from multiple customers and load everything into a single container. With RoRo shipping, cars are transported on specialized car-carrying vessels. The ships are designed to allow cars and other wheeled vehicles to be driven onto the deck from the shipping dock. Customers who choose the roll on/roll of shipping option often have to drive the vehicle to the shipping port, or arrange to have it transported to the port by an auto transportation company. RO/RO shipping vessels are equipped with large open decks with marked parking lanes and parking spaces. Vehicles are driven to their allotted parking spaces and secured in place with tie-down straps and chains. When the ship arrives at its destination the car is driven off the ship and to the dock, from which it is returned to the customer. Both the roll on roll off car shipping and container car shipping options have their advantages and their disadvantages. The biggest advantage with containers is safety and convenience. 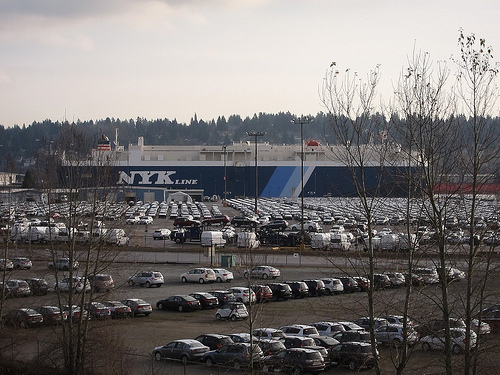 Since cars are transported in enclosed containers, they are less likely to suffer damage during transit. 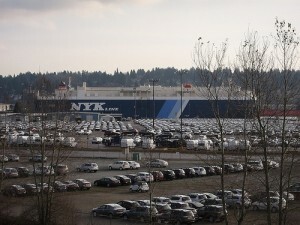 Cars that are transported on RoRo ships are parked on open decks and can, infrequently, be damaged from exposure to the elements during transit. Containers are also more convenient for people who want to transport household goods and other items in addition to their car. However, container shipping is significantly more expensive than RoRo shipping. In many cases, the price difference between the two options can be as high as 25 percent to 30 percent, or even greater. Roll on/Roll off shipping is often the better option for those who might have only have a single car to ship, and do not mind the small risk of the vehicle suffering minor damage during transit.